Fans will share photos that you upload with friends and family on Facebook & Twitter. Your photos will start helping ticket buyers in minutes. Contact me. I would be happy answer any questions and you help out. Anyone at your organization can do this with ease. Satdiums and large ballparks usually take 1-2 hours to cover the entire venue. *If you have photos on your computer, you can start uploading them now or contact us for dropbox or FTP access. This lets your fans know that you're sharing these photos to help improve their experience. All it takes is a profile name and password. Take a nice, centered photo of the ballpark, field, court or pitch. 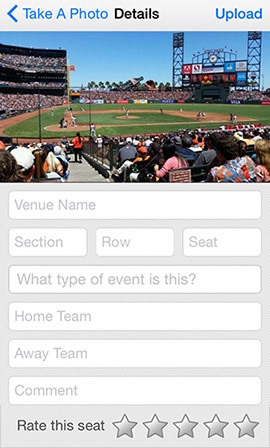 Add details about the view including the type of event, section, row & seat. If you can't get the entire playing area in your photo, consider uploading a 2nd photo. Some examples would be the scoreboard, the other end zone, the dugout & other fun or unique attractions. A View From My Seat supports an infinite number of photos from every seat. Go to the next section and repeat steps 3-5. Once you've made it around your venue, you're done. We curate photos as they are uploaded for quality, accuracy and family friendliness. By now, most of your photos will already be live across the A View From My Seat network. Upload more photos throughout the season to show the fun, family friendly side of your venue.